The “Make It Count” Pledge represents your commitment to delivering quality out-of-school time programming for Arizona kids. Make It Count programs use Schools Out, Make It Count: Arizona Quality Standards for Out-of-School Time Programs to Learn, Implement, Fine-Tune and Teach — LIFT! their programs to new heights of quality. By signing the “Make It Count” Pledge, you commit to continuously work to improve the quality of our program. We pledge to always aim to make our program a work in progress, striving to be greater each day. The “Make It Count” Pledge demonstrates our commitment to working to be better than we were the day before because the youth we serve deserve high quality and “quality” is not static. Quality looks different at every site, it changes over time and with every new group of kids. We commit to Quality. We commit to “Make It Count” for every kid in our program. 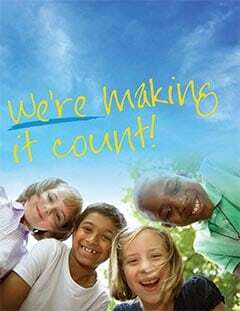 Join the many other Arizona out-of-school time programs that have already signed the Make It Count Pledge! i.e. "City of Tempe Kid Zone", "Flagstaff Unified School District FACTS", "Boys and Girls Clubs of Metro Phoenix"
i.e. "Killip Elementary School," "Colangelo Branch"